On 8/29/15 a quartet of us drove to Thompson’s Station to provide music for the nuptials of Daphne and Brandon. It was abundantly clear that these two and their families were fun-loving, relaxed folks full of love and laughter. 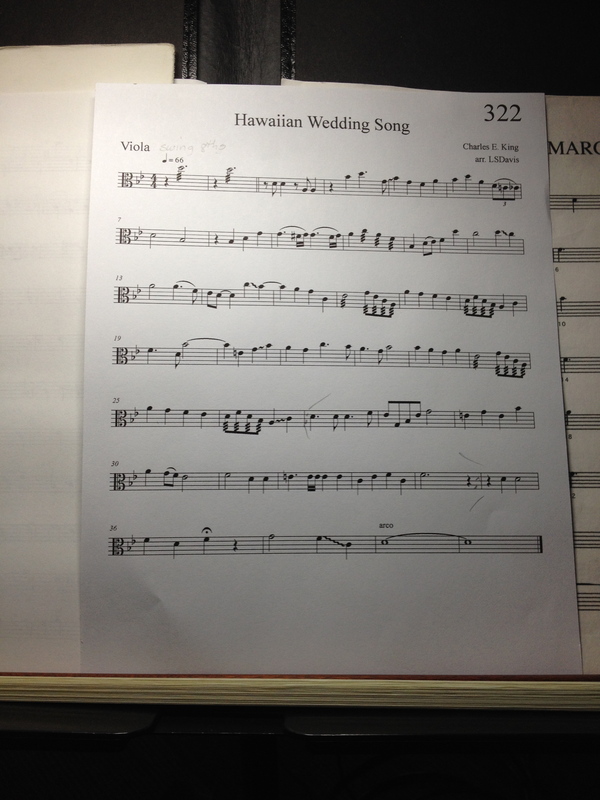 Daphne is Hawaiian and of course requested “Hawaiian Wedding Song” to be played for one of the processionals. So after we seated the mothers to “Simple Gifts” we launched into “Hawaiian Wedding Song” for the entire wedding party. Daphne chose the traditional “Wedding March” for her entrance. During their ceremony they had a unity ceremony of knotting three cords to symbolize their union with the inclusion of Brandon’s daughter. We played a couple of verses of “The Prayer” while they accomplished this ceremony. Then for the first time ever, we played the Bach Brandenburg Concerto No. 4 for the recessional. It was a wonderful choice for them, upbeat and beautiful. When I got home from the wedding ready to do my impression of a vegetable in front of the tv, I turned to PBS and saw that a program of snippets from old Lawrence Welk shows was being shown. I normally wouldn’t have watched this program but right when I flipped to that channel the opening strains of ….you guessed it — “Hawaiian Wedding Song”…caught my attention. I have to say our rendition of that tune was much more beautiful than the one on Lawrence Welk. Silver Strings wishes Daphne and Brandon much happiness and laughter all the days of their lives together. Meanwhile also on August 22 at Benton Chapel on the Vanderbilt campus Melissa was getting married to her sweetheart, Clay. Susan Mullen led a trio for me in that lovely chapel. Melissa had requested “Thinking Out Loud” by Ed Sheeran for their prelude…which turned out to be quite nice if I do say so. She chose a mix of traditional and contemporary for the processionals including “To Make You Feel My Love” for the mothers, “Canon in D” for the maids” and “In Christ Alone” for her processional. At the conclusion of the ceremony they were sent back down the aisle to “All You Need Is Love”. Congratulations to Melissa, Clay and their families. Here’s a wish for abundant happiness for as long as they both shall live. I had to get up in the very wee hours of the morning of August 22 to make it back to Nashville in time for the wedding of Jenna to Dustin at the gorgeous East Ivy Mansion on Nashville’s East Side. It was overcast that day with occasional light drops of rain but the deluge held off until the ceremony and dinner were finished which all took place outside. Whew!! Jenna and Dustin, being as relaxed as they were, were a pleasure to work with. The music they chose included “What a Wonderful World” for the mothers, “Imagine” for the groomsmen, the beautiful “Ladies in Lavender” for the maids and “Canon in D” for Jenna. Jenna chose a fun song for their recessional…”Defying Gravity” from the Broadway musical “Wicked”, which worked very well as the recessional actually. After the ceremony we moved to a small stage in the garden to play classic rock tunes including “In My Life”, “Don’t Stop Believing” and especially “Brown Eyed Girl” for the cocktail hour. Congratulations Jenna and Dustin! You did it! Have a long and happy life together! Because I was still lollygagging by Lake Erie in northern Ohio, Jocelyn Sprouse led a trio for me at the wedding of Matthew to Sarah at the Schermerhorn. I did get to meet this couple over coffee to discuss their music and found them to be such a lovely and fun couple. They chose traditional wedding music for their ceremony that included “Jesu”, “Trumpet Voluntary”, and “Canon in D” for the processionals with “Ode to Joy” for the recessional. For the cocktail hour the trio switched to the fun stuff to get the guests warmed up for the following festivities. They had requested “I Think We’re Alone Now” to be played during the cocktail hour. They heard and liked the song as done by Tiffany while I had fond memories as a teen of the same tune, only this time done by Tommy James and the Shondells. What they got from the trio was sort of a cross between the two. Congratulations to Matthew and Sarah! I predict many happy years together for them. I know, I know…I’ve been neglecting my blog for the last two months. Blame it on the summer and my disappearance for a month to Ohio to play in a summer orchestra. So….On July 18 Silver Strings presided over the music for marriage of Laura to David in a beautiful ceremony in the lobby of the Schermerhorn. The musicians included a string trio augmented with keyboard, trumpet and a wonderful vocalist, Julie Cox. Prelude included expansive movie music themes such as the theme from Starman (anybody remember this movie? ), Last of the Mohicans and Somewhere in Time. Having the keyboard, played ably by Mark Schaffel, really brought added dimension to the music. Alan Suska on trumpet added the sparkle and anticipation to the expectation of the vows. It was such a pleasure to accompany Julie Cox whose beautiful voice soared over the lobby of the Schermerhorn. She sang “The Prayer” (at my request) for the prelude and “One Hand, One Heart” for the unity candle during the ceremony. For the processionals mothers and groomsmen arrived to “Jesu, Joy of Man’s Desiring” while the bridesmaids entered to the always appropriate and beautiful “Canon in D”. Laura, however, stepped away from the traditional music to enter to “Heavenly Day”. After the couple were pronounced married we sent them back down the aisle to the traditional Wedding March”. I’m personally grateful, as I know the rest of the musicians were, to have the wedding conducted indoors. The heat index that day was 106º F, a little toasty in our opinion to be outside melting even in the shade and enduring the noise from those annoying pedal bars. Sara Willard is a pro at coordinating weddings which makes our job so much easier. So we were comfortable and confident that we would get the proper signals at the proper time. Who could ask for more? Congratulations to Laura and David and many wishes for a long and happy life together.